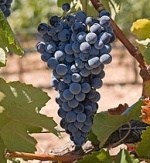 Alicante Bouschet originated in France, as a cross between Grenache and Petite Bouschet. Although it has been primarily used as a blending grape, Alicante Bouschet is also produced with great success as a premium varietal by a select group of California boutique wineries. Alicante Bouschet makes a spicy, earthy, dark purple-colored, rich wine that matures beautifully with cellaring.